At WPhost, you’ll already get top performance out of even the highest traffic sites, but if you want even more speed, opt for our Silver, Gold or Platinum plans to take advantage of Cloudflare's Content Delivery Network. A Content Delivery Network (or CDN) is one extra feature you can add to your WPhost plan so your WordPress website chases the speed of light. With a CDN, your visitors will receive images and static files from the server that’s physically closest to them. That proximity ensures their experience with your site is always crazy fast, no matter where in the world they’re located. For example, let’s say you’re a Silver, Gold or Platinum WPhost client who’s taken advantage of their free Cloudflare account. Predominantly your clients are in New Zealand and Australia. Your Cloudflare CDN serves your assets from a bunch of different servers based around the world, including Auckland, Melbourne, Sydney, Brisbane and Perth. The idea is that users will hit the server closest to them and not sacrifice load time, since there’s a smaller distance between them and the server. Therefore, a Melbourne based visitor will hit your data centre in Melbourne. Similarly, a visitor based in London will be served your website from London! Using a CDN will definitely increase the speed of your site for users throughout the world! But wherever your clients, WPhost is committed to unbeatable page speeds for a global audience. Cloudflare caches your content across their global network, bringing it closer to visitors from every region. Cloudflare has built the next generation Content Delivery Network. Their platform was designed and built to integrate emerging technologies to ensure customers receive the most advanced protocols on the web; today and tomorrow. Cloudflare has built a global network designed to optimize security, performance and reliability, without the bloat of legacy technologies. The result is a CDN that is easy to setup, more affordable, and performs better than any CDN you’ve tried before. 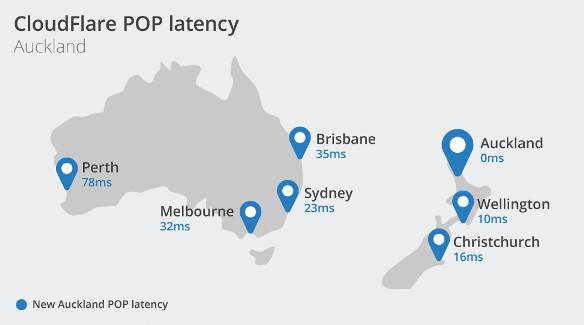 Cloudflare is a member of New Zealand’s largest peering exchange, APE-IX and has structured a solution to reduce latency and localise traffic for users in New Zealand while also allowing for full redundancy between both Auckland, Sydney and the rest of Oceania. Cloudflare's Content Delivery Network is powered by 151 Data Centres around the world.